The National Socialist Council of Nagaland (Isak-Muivah), ( NSCN -IM) held a high-level consultative meeting with various Sumi apex bodies in Dimapur on December 5. The meeting has been dubbed as crucial as Kilo Kilonser Hukavi Yepthomi has been ‘ceaselessly reaching out to the Naga people on the line of changed political situation following signing of a Framework Agreement between the Naga leaders and the GoI’, as stated in a press note from the MIP, NSCN (IM). 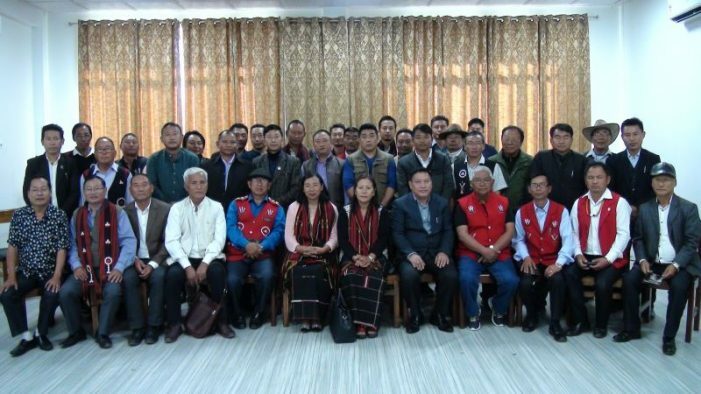 The NSCN (IM) delegation included Kilo Kilonser, Hukavi Yepthomi along with several NSCN/GPRN leaders comprising of Steering Committee members, Kilonsers and Deputy Kilonsers. The meeting was also attended by the Sumi Hoho, Sumi Kukami Hoho, Sumi Totimi Hoho, Western Sumi Hoho, Western Sumi Kukami Hoho and Sumi Kiphimi Kuqhakulu. The media release also stated, “Key sectors in present Naga areas have become better acquainted with the progress of peace process and also understood the nature of blatant misgivings as constantly propagated by certain sections of our own people to further confuse the truth with fact”. The NSCN (IN) further stated that the issue of transmitting correct information on perspective that warranty implementation of what has been achieved in such sustained and forward move after putting a Framework Agreement in place is Kilo Kilonser Hukavi Yepthomi’s topmost priority. The NSCN (IM) also reiterated its commitment towards the Sumi community to ‘continuously and consistently extends its optimum cooperation in future’. The NSCN (IM) kilo kilonser was accompanied by members of the outfit’s ‘steering committee, and kilonsers and deputy kilonsers.